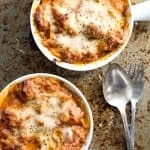 A rich tomato and sausage based sauce with bacon red wine and herbs. After simmering add ricotta cheese for a velvet finish and layer with lasagna sheets and fresh Parmesan cheese. In a large 10 inch pan cook the bacon pieces until pink. Add the onion and stir over a medium heat until they turn soft. Add the minced garlic and sausage meat. Break up the meat with a wooden spoon and stir well. Add the olive oil, basil and oregano and cook for about 5-7 minutes and the meat is nicely browned. Open the can of tomatoes and using your hand slowly squeeze each tomato roughly crushing it into the sausage mixture. Continue until the whole can has been emptied into the pan. Add the tomato paste and wine, stir well. Season with the salt and pepper, bring to a boil and then simmer for at least 30 minutes on low. Once the sauce is thick and rich, add the ricotta cheese and stir well until all of the cheese has been mixed through evenly. Start to build the dish. Place a thin layer of sauce on the base of the pan then a layer of lasagna sheets. Spread more of the sauce over the pasta and sprinkle with lots of Parmesan cheese. Repeat the process of layers until you have enough sauce to finish with a final layer on top. Sprinkle the surface with plenty of Parmesan and place in the oven. Bake for about 40-50 minutes or until the sauce is bubbling around the edges and the cheese is melted and golden. Let cool for 5 minutes then serve with fresh warm ciabatta bread.